I was wondering what will happen if I was wearing headphones or asleep (or both) and I missed the in-flight food? I don't want to miss it, but I know when I get lost in my music or fall asleep I hardly notice anything around me...Is this possible? How does the staff inform the passengers about the food? This might come off as kind of a dumb question, but I've never travelled long-haul before, and I'm very paranoid by nature. A senior cabin crew member here. Service: So no one misses the meal, then give us hard time later trying to get them one, or even worse, file a complaint! Also, meals cannot be served more than 30 minutes after they are heated, and cannot be reheated. Safety: So we check on the well-being of passengers. Many of the passenger incapacitations on board are discovered when we couldn't wake them up during meal services. I personally was on a few flights where seriously ill passengers' lives were saved because of trying to wake them up and figuring out that they need help. This is a policy in my airline, I think other airlines have the same policy. 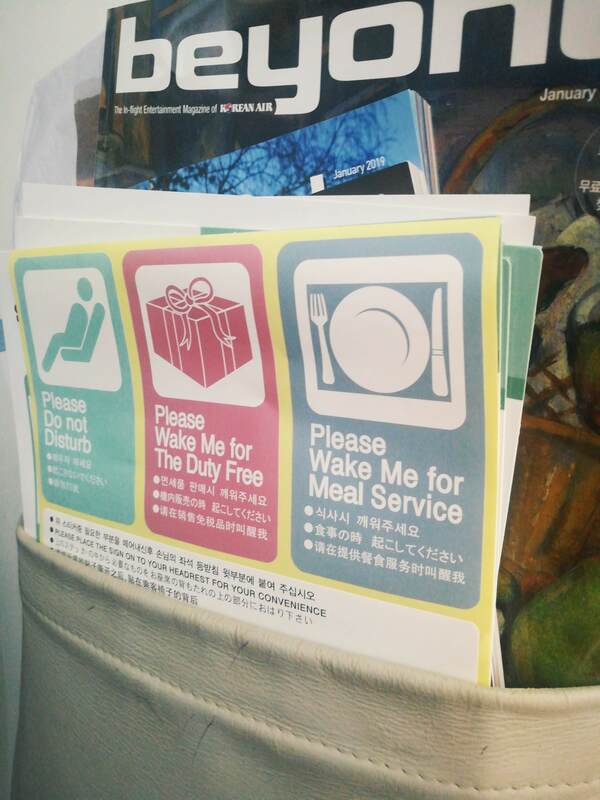 An exception is when the passengers make it clear that they do not want to be disturbed (by telling the passenger next to them or by the DND sticker in some airlines), then the cabin crew will assume they are in deep sleep and they do not want to eat. Out of experience, very few passengers do that especially in long haul flights. Anyhow, in case you missed the meal, ask the crew. There are usually some extra meals here or there. Always tell the cabin crew what you want. In a kind way. When they are not busy, ask gently, "I am not a frequent flier, and this is new to me; could I please be woken for the dinner service?" Additionally, for an extra help, kindly ask your neighbor passenger to wake you if the flight attendant does not (even though he probably will), noting that it's okay if your neighbor passenger forgets or is asleep themselves. There are meals for everyone on board. Not everyone eats even and falling asleep in an airplane is a rather difficult thing to do, so when staff passes to distribute meals, they will simply move along. This is not a much of a problem because you can always call an attendant and request your meal at a later time. The common disadvantage of this is that they may run out of one of the meal options, if you are on a flight which offers a choice. However, you can easily get around this by requesting a specific meal type, so it will be reserved for you. The only time you might actually miss your meal is if you manage to sleep through until the descent, at which point tray tables must be locked and they will not serve you. Unless, flying first class, an airline meal is not usually something people rave about. Sometimes I get served the meal and I end up not eating as it's so awful. The other way to get your meal is to fly with someone else and let them know you want the meal. It is very common for flight attendants to ask if they should leave a meal for a sleeping member of family. This happens all the time with my kids since they actually manage to sleep on planes. Although I have never seen this happen, according to comments food safety may prevent a meal from being warmed past a certain time if it was warmed before. When a flight is that long though, there is a second warm meal service (or even three) sometimes. Assuming you slept that long, I would consider it a good thing! Often, at the start of the flight, the crew will announce the times at which they'll be serving meals or you may find this info on a menu (if they hand one out) or in the inflight magazine (e.g. Korean Air). Normally meals are shortly after departure and/or shortly before landing. If you want to eat the first meal you can simply stay awake until it is served. For the final meal, the crew normally has to wake most everyone up for landing to check seatbelts, etc. so they just do it a bit earlier to do the meal service - all the lights turn on and there is a lot of noise and people moving about in the cabin so you may wake up. Really long flights, especially daytime flights, may feature additional mid-flight snacks. These are easier to miss since the crew tries to let those opting to sleep rest. However, the crew is normally flexible about these, the food served is typically less perishable, and you'll likely easily be able to get this snack later if you slept through the service and wake up hungry - just ask nicely. When I was younger airlines had tags on the seats where it indicated if you wanted to be woken for food. But that's now not the case. You could inform the flight attendant when you board that you want to be woken for food, but there is the chance that he/she might forget and/or that flight attendant won't be serving in your cabin. Your best bet probably would be to ask your neighbor to wake you when food comes. You could even write a sticky note for the flight attendant. I often fall asleep on airplanes, but most of the time the attendant or the passenger besides me will wake me up when food is served. Sometimes I'll wake up for the food, but other times I'll tell the attendant I'm not eating, if there's nothing I want to eat. Unless you are flying First Class, or flying with a carrier like Singapore Airlines (which does have good food), people don't worry too much about the meals. On most airlines, food is terrible. Failing everything, if your flight is long enough, you could usually request snacks. When I miss my meal on my Cathay Pacific flights and feel hungry, I ask them for cup ramen. So, don't worry too much about getting starved on a long haul. I was recently on a long (14+ hours) flight and subsequently a short (3 hours) connecting flight. There was no announcement for meal times but they woke up passengers for all major meals (dinner and breakfast). However, this was not the case for snacks. I missed a bag of peanuts myself while napping. I've also seen other airlines leaving snacks right next to the passenger when they were asleep. I fly long haul quite often with a variety of airlines. From my personal experience, fight crew will always wake passengers for meals. The only notable exception in my experience was Emirates Airways, where they would not wake you by default. 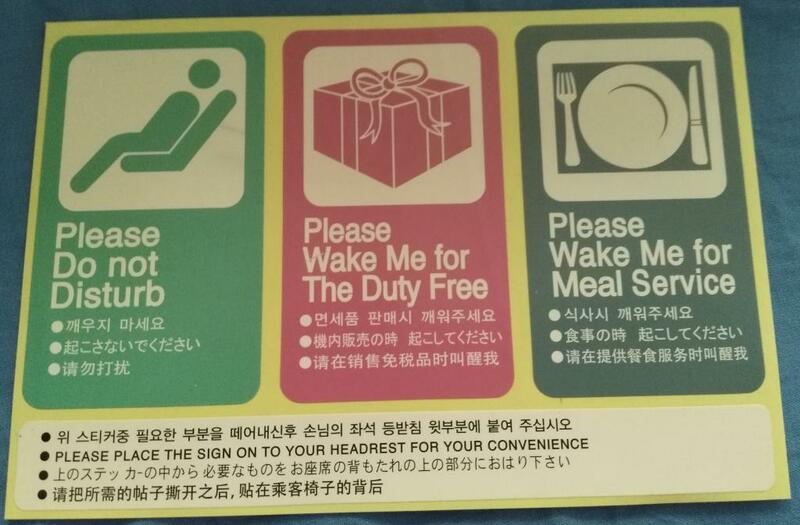 Instead, they provided all passengers with small stickers "wake me for food" and "wake me for duty free", which they asked passengers to put on the corners of their seats as appropriate. This was the case in both business and economy class. Do note that in business class they had hot food available on demand for the entire duration of the flight (with reasonable exceptions of take off, landing and turbulence). Last time I flew with them was about 5 years ago though, so things may have changed. Pretty good answers by others already. But I like to stress one possibility that you could not get your food later. I almost always ask a flight attendant to serve more meal, usually one or two but sometimes more, if there are leftovers. Most airlines are willing to serve these leftovers to passengers who want more meal. If you are sleeping and crews don't serve your food either by waking you up or putting it on your table, your food might get consumed later by gluttony. Recently I got on a 10+ hours flight. It departed around midnight so the first meal was only a sandwich. Once I finished eating it I asked a flight attendant if they could serve me more sandwiches, and she kindly got me more. However, after she served me 5th leftover, she said it is the last one. So it is possible that you could miss your meal because a glutton on your flight wipes out leftovers! You can miss a meal. I usually sleep on long flights, and the flight attendants don't usually wake me for meals. If you are worried that they might skip you because you are asleep, talk to the flight attendant and ask to be woken at meal times. In my experience this largely depends on the airline. Thus you need to ask a flight attendant once you board: "if I'm asleep, will you wake me up when serving dinner?" If they do not, ask "what shall I do to ensure you would?" European airlines (except low cost) tend to wake up everyone (Lufthansa even forces you to bring your seat upright even if you don't eat). So if you are flying with one, you will not miss your food. If you want want to be left alone, you have to tell a flight attendant, but in my experience they ignore this and will wake you up anyway. American airlines, and low cost airlines all over the world tend not to wake passengers who are sleeping at all, unless you're obviously in distress. However they usually will reserve a meal for you, and would be glad to serve you once you're up. if you do this, they will respect the choice. If you do not, they seem to be trying to guess how deep is your sleep, by verbally asking if you want to eat. If you do not respond, they leave you alone. They will always have an extra meal anyway. Also, as others mentioned, the airline will almost always have an extra meal for you. But to ensure this, you can order a special meal at check-in. Not the answer you're looking for? Browse other questions tagged air-travel food-and-drink in-flight-services cabin-crew or ask your own question. Practical food to take on flight without anything served? Is the word “bomb” muted in in-flight movies? Can I call the flight attendant “Sir/Ma'am” to get his/her attention? How to know ahead of time if food will be served during a flight?